Coleslaw is such a basic salad, widely served with burgers, baked potatoes, chips or french fries, in sandwiches and so many other things. Unfortunately all those who don’t eat eggs cannot really have it as it has mayonnaise. I make my coleslaw at home without the mayonnaise. 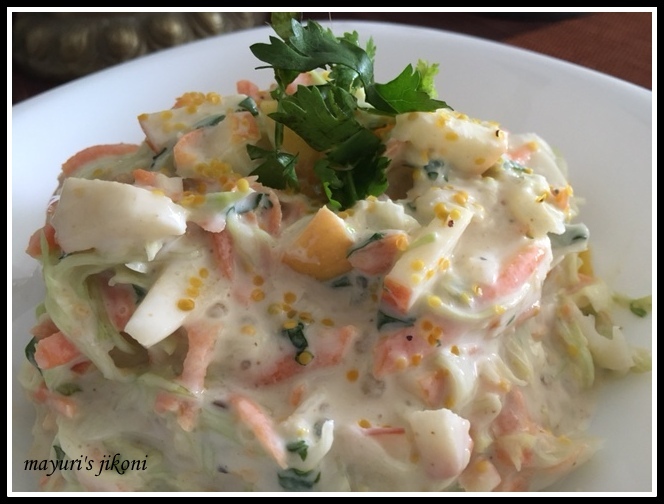 Once when I made the coleslaw to go with the baked potatoes, Niku said ‘Mum, make the cabbage salad a bit more interesting. Add some grapes’. That was when he was just about 7 or so. Then and there I should have figured out that my son will choose a career where food is the major interest. He is not a chef but works for the hospitality industry. Over the years many more suggestions have poured in from him to make that slight difference to a dish. So Niku, the coleslaw recipe is yours with my dressing recipe. Mix the cabbage, carrot and fruit in a bowl. To prepare the dressing, add sugar, salt and mustard powder or paste to the yogurt and mix it into a smooth consistency. Chill it for a while before serving. For a more creamier dressing, take half yogurt and half fresh cream. Can add any fruit of your choice like grapes, pears, pineapple, strawberry etc. Add finely chopped green chilli if you like. Can add a bit more mustard if you prefer a pungent taste. Shred the cabbage using a mandolin. Use greek yogurt or put the yogurt in a clean cloth and sieve to remove excess water for about 30 minutes. Put the cloth in a sieve. Put the yogurt in it. Let the sieve rest on a bowl so the water drains out. I like the sound of this coleslaw because I hate mayo. I too hate mayo Heidi. Definitely Shobha, a fusion raita.